"SNG will be free to HSR Club members". When I began the SNG Project, I had only one overriding objective for gameplay. That was to present the players with realistic naval gunnery situations that would be a challenge to solve. After many years of very hard work, I believe that that goal has been achieved. The essence of playing SNG is situational analysis leading to decisive decision making. · What are the enemy goals? · What are my strengths and weaknesses? · What are the enemy strengths and weaknesses? · How are the environmental factors affecting the situation? How can I use the environmental factors to my advantage? · How is the overall campaign and this battle now going? Am I now winning or losing? Am I overconfident or discouraged? Calamities are a part of naval gunnery operations. Can I recover? · What is the enemy state of mind? · What can I do? What are my strategic/tactical choices? What is the best move I can make regardless of the overall situation? Does this move fit into my overall plan? Do I have an overall plan? How can I hurt the enemy the most, even if I might currently be losing a battle? What are the solid and proven combat procedures? · What can the enemy do? What is the enemy likely to do? What would I do in their situation? What indications do I see about the enemy intentions? Is the enemy pursuing an overall plan that I can perceive? · How can I surprise the enemy? Can I disrupt their intentions? What are the enemy fears? Can I present them with an unexpected difficulty? · Is the enemy trying to surprise me? · What are the risks? Should I take an acceptable risk? Would such a move just create an advantage for the enemy? Is a near term loss a long term gain? Or, does a slight gain now hurt me over the long term? · Have I made a mistake? Can I recover before it is too late? · Has the enemy made a mistake? How best to take advantage of it? Or, is it a trap or diversion? To answer these questions you need information and experience. · In SNG, you get most of your information by mouse movement. You can get a lot of information very quickly. And, most information is updated automatically. If there is too much information, you can slow the pace or pause the game. · To get experience, you need to play a lot of SNG. This exciting facet of SNG gameplay adds an entire layer of additional complexity on top of the above issues. Essentially, the team must solve these problems in a spirit of cooperation, mutual support and inspirational creativity. · Often, one member can propose a solution the others cannot see. There is usually a wide range of experience levels amongst the team's members. It is probably best if each team member retains the right to make the final decisions for their own command. · A single team member can steady the team's morale. · Team leadership is itself a very complex and sensitive issue. If handled poorly, it could produce too much friction and reduce game enjoyment. Being positive and supportive is the safest policy. Theoretically, it would be possible for all team members to agree upon a workable military style of team organization. However, this is probably too ambitious and too risky. · Blame and post-game bickering could ruin an otherwise enjoyable game experience. (Please keep the HSR Club Foundation Tenet in mind.) It does take a strong sense of camaraderie to objectively evaluate the results of a session with the goal of making the next session even more fun. Usually, an 'After Action Report' contributes greatly to team enthusiasm. · A big advantage to team play is that each member may need to analyze less information. Please refer to the SNG User Manual and Key_SNG_Controls.rtf (accessible via the SNG Help menu) for guidance on how to collect information and invoke your decisions. This section is devoted to bringing you, the reader, information about SNG that will give you a keener understanding of the devotion that went into it's creation. SNG is not just another wargame, and that's not just talk. The inherent qualities of the game speak for themselves. Every week we will be providing more information about this game that makes it more than a game. It truly is a historical strategic re-creation. The first of it's kind. Of course, if you want to start enjoying it right now just go to the HSR Store page. This section contains special considerations made to make the game more playable and more realistic from the overall view. It is helpful when considering the realism of the game to remember that it is grand strategic level game and many details are abstracted. What counts in this type of game is the similarity of the final result to the possibilities presented in the historical situation as well as the overall 'feel' that the game produces with respect the decisions of grand strategy. Here is an excerpt from the designer notes to give you an idea of the kind of considerations that went into the design. The designations of the various types of cruisers were undergoing significant change during this historical period. Scout Cruisers, Protected Cruisers (PC) and Armored Cruisers (AC) were being replaced by Light Cruisers (CL) and Battle Cruisers (BC). The term "Cruiser" (C) seems to be used most often for ships that didn't fit quite completely into any of these categories. These designations have only minor effects on the actual play of the game. The Japanese ships Ibuki, Ikoma, Kurama, and Tsukuba are designated as ACs. It is arguable that they could carry the BC designation. 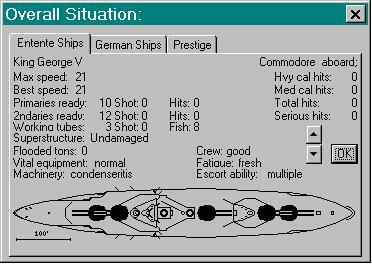 The Canopus class battleships have their gun range limited to reflect their age, unrefurbished state, and greenness of the crews. The Hizen has its gun range reduced to reflect its age. Several small, old protected cruisers, destroyers, torpedo boats, and armed merchant cruisers are included in Strategic Naval Gunnery in an abstracted form. These include ship like the: Cosmao, Pegasus, Pioneer, Philomel, Psyche, Pyramus, Tokiwa, Yakumo. Their impact on the game is within the defensive attributes of Entente bases and the inherent escorts in the Merchant Areas. Also, French miscellaneous small craft are included in adjustments to characteristics of French ACs. Greater ability to achieve multiple hits. Powder burns rather than explodes. The above shows the status of the King George V Battleship just before the battle of Jutland. Yes I said Jutland! I have experienced this battle first hand with all the excitement that a battle with over 251 ships can offer. Smoke, maneuver, pursuing, fleeing, torpedo attacks, ships blowing up, everything that can happen will happen. The largest naval surface action ever. If you want this experience you will need to play SNG. The following is just a small portion of shell hitting detail during the battle of Jutland. +++++++++Derfflinger 12 inch belt armour resists 13.5 inch 45 at 18 kyds. +++++++++Tiger 5 inch turret top armour resists 12 inch 50 at 20 kyds. +++++++++Von der Tann 3 inch secondaries armour PENETRATED by 13.5 inch 45 at 20 kyds. ++++++++++++Von der Tann;deck bulged several feet. +++++++++Valiant 12 inch barbette armour resists 12 inch 50 at 19 kyds. +++++++++Warspite 13 inch belt armour resists 12 inch 50 at 19 kyds. +++++++++Kronprinz Wilhelm 14 inch belt armour resists 15 inch 42 at 19 kyds. Visitor Counter. Use your "Browser BACK button" to return to this page from the site meter.